Collections are lists of posts that you control. 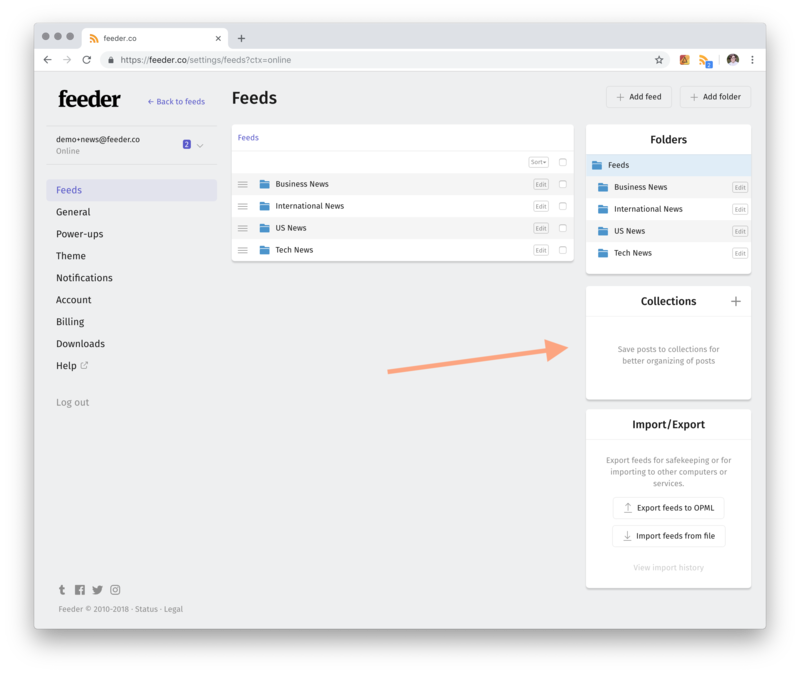 It’s a powerful tool to help you stay organised, or create new workflows with your feeds. Create a Collection on the settings page. 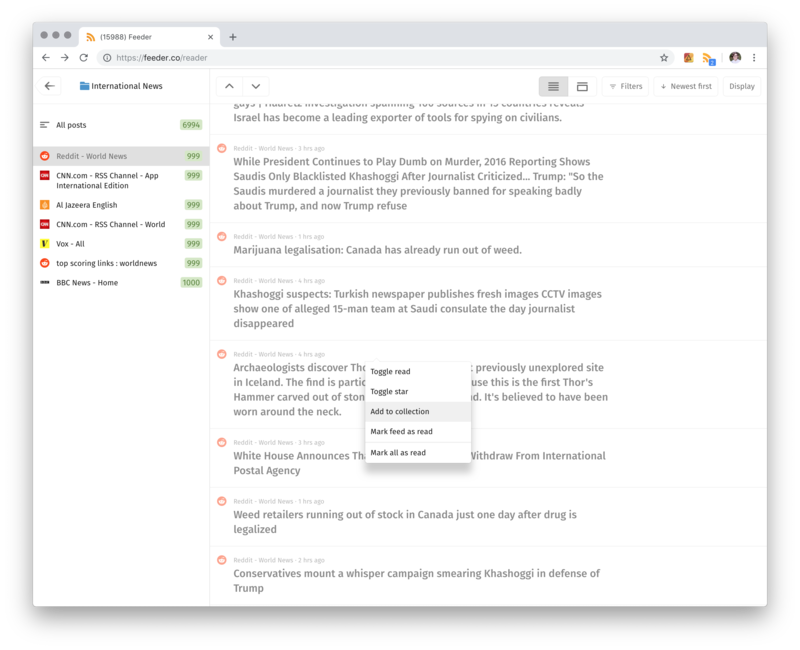 Your defined collections are listed in a box next to your feeds. Press the “+”-button to create a new collection. Name it something appropriate, and choose an icon and color that best represents what you plan on putting there. Press “Add collection” and it will appear at the in your feed list. This collection can be moved and added to folders, just like a regular feed. Note: A post can be added to as many collections as you wish, but can only be added once per collection. Right-click on a post and the Collection Dialog will appear. In the Reader and Minimal mode, the Collections icon will appear at the bottom, together with the Share/Star/Read icons. In the Minimal mode the Collection icon will appear in the top bar. Right-click on a post and the Collection Dialog will appear. Click on the Collections you wish to add a post to and press “Done”. When navigating with your keyboard, press P to activate the Collections Dialog on the currently active posts. Use the Up/Down keys to highlight a collection and press Enter to add it. Press Esc when you are done to hide the dialog. There is no magic to browsing a collection. Navigate to it just as you would a feed, and browse the entries. Besides the Collection Dialog mentioned earlier, posts can be automatically added to collections based on filters: Using the “Add to Collection”. 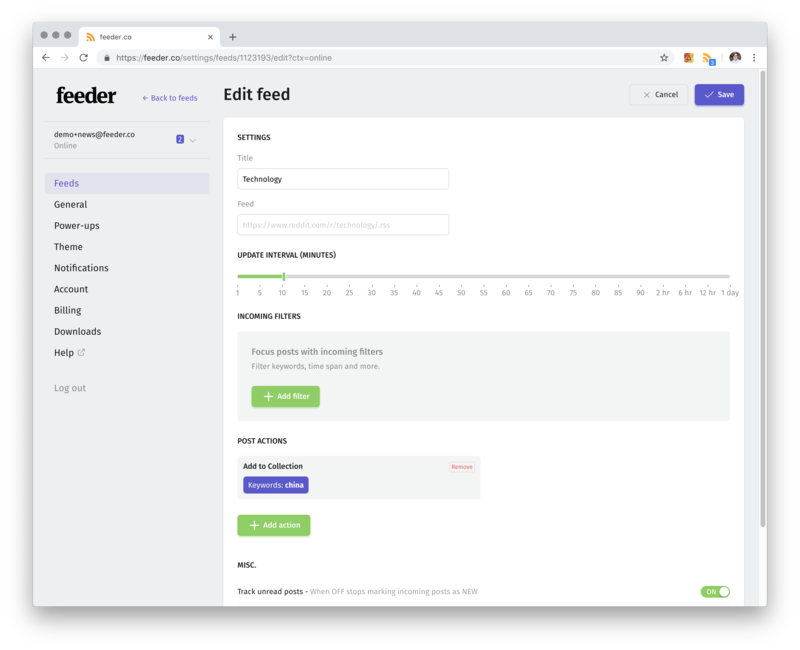 Open the feed you want as subject, and press “Add Post Action”. Choose the “Add to Collection” option and start adding your criteria. 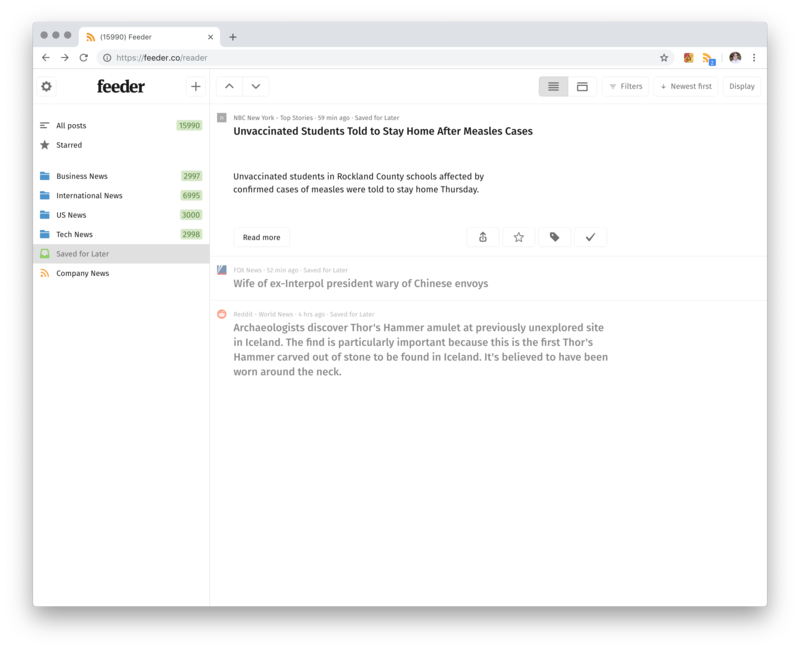 In this example, we have created an action on the Reddit.com/r/technology feed to add posts that contain the word “shanghai”. 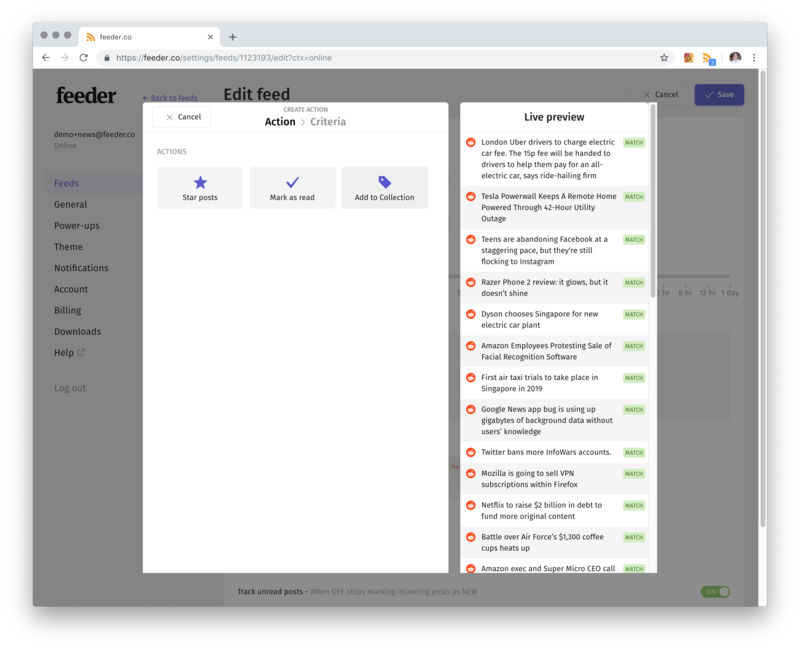 Note: A feed can have as many post actions as you’d like, so you can add a post to many different collections. In the picture below is an example of adding posts to multiple collections based on different criteria. A collection can be shared just like a feed or a folder. 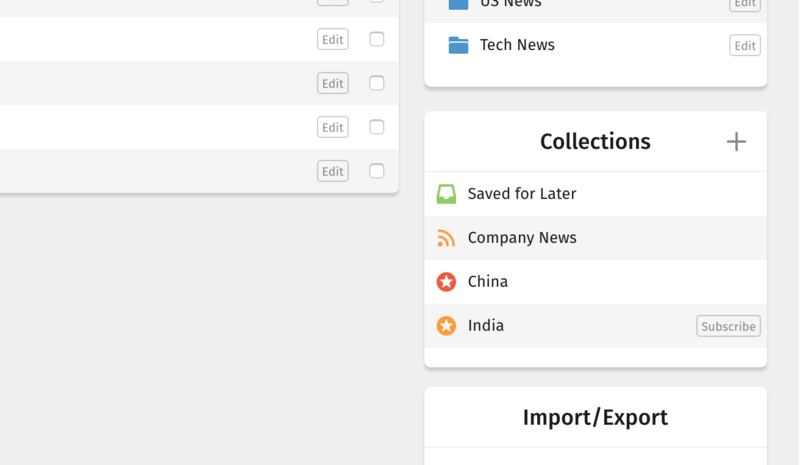 To share a collection, open the Business section and navigate to Shared Feeds. 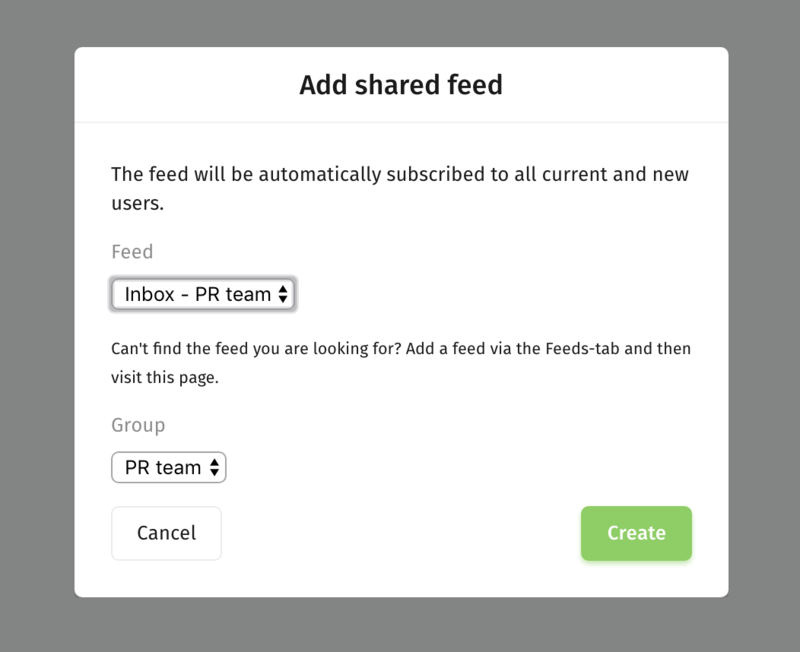 Click “Add feed” and chose the feed, and if needed, the user group it should be in. It is now shared to the selected teammates and will appear in their list of feeds just like any other feed. Follow the procedure outlined previously for adding posts to the collection. 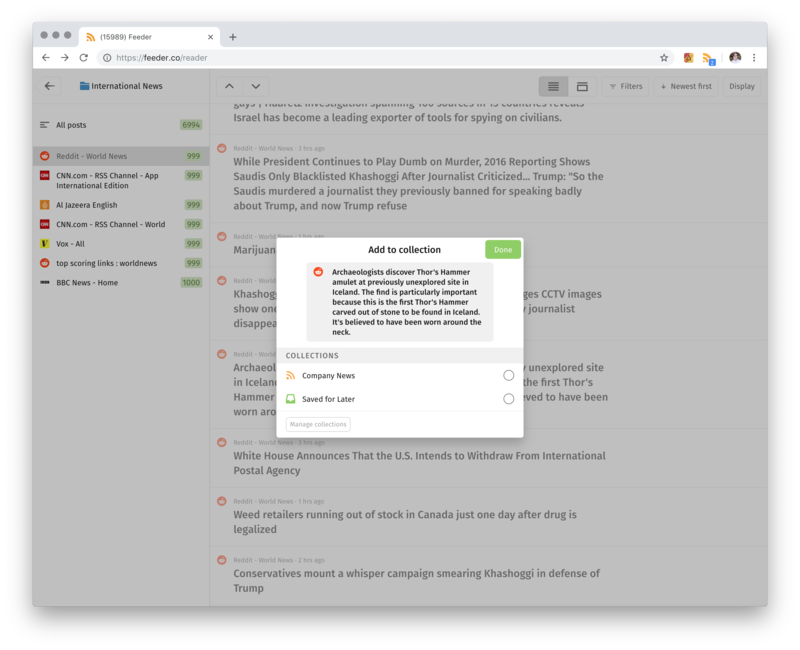 When a post is added to the collection users will receive a notification just like any other post (note that users can opt out of e-mails and notifications as they please). Currently, any user in your team can add any post to any collection. Since a collection can be shared with any number of teammates, unsubscribing to a collection does not delete the underlying collection. If a collection is deleted from the feed list, it will still appear in your list of collections. If you wish to re-add the collection to your feed list, simply press “Subscribe” next to the name. A collection can be deleted permanently as well. Just click on a collection in the list and press “Delete”. Note: There is no way to bring it back once deleted. 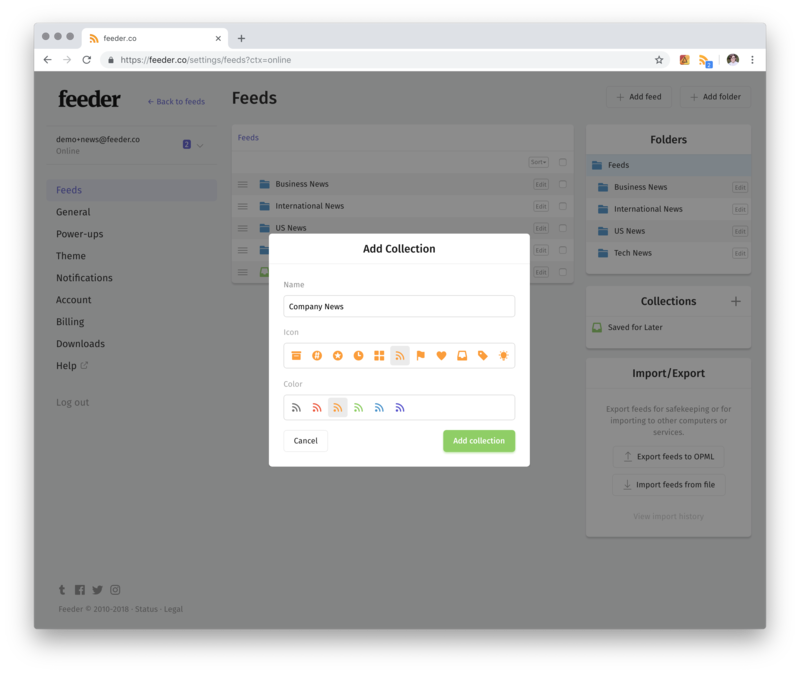 Feeder Dashboard & Collections make for a powerful use case. 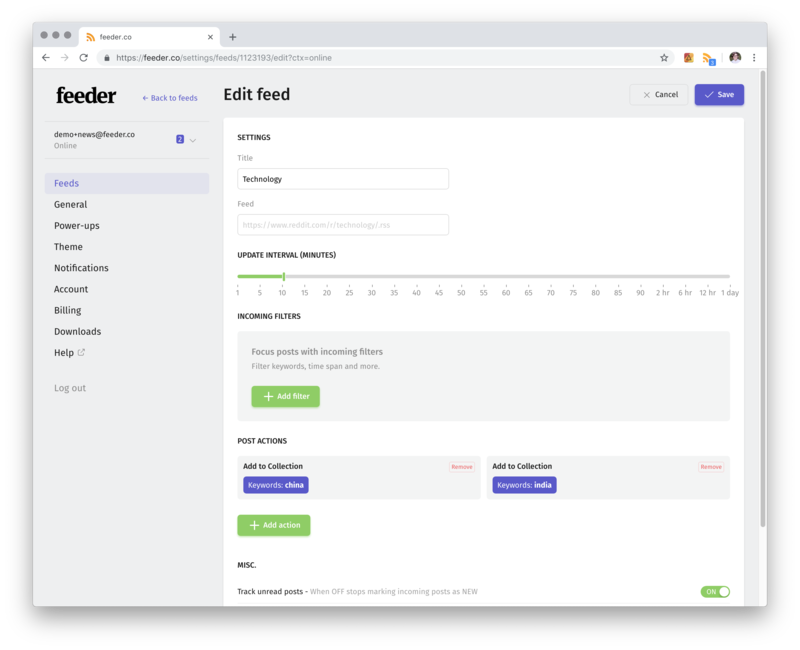 Collections can be opened in the Dashboard just like any other feed. Setup Actions to automatically add posts of high importance, and keep a pane open just for those. It will help you faster triage your important tasks and notices. Collections do not work well with Incoming Filters. Really Collections with Post Actions can be used to solve the same problem: Only seeing posts relevant to your interests. 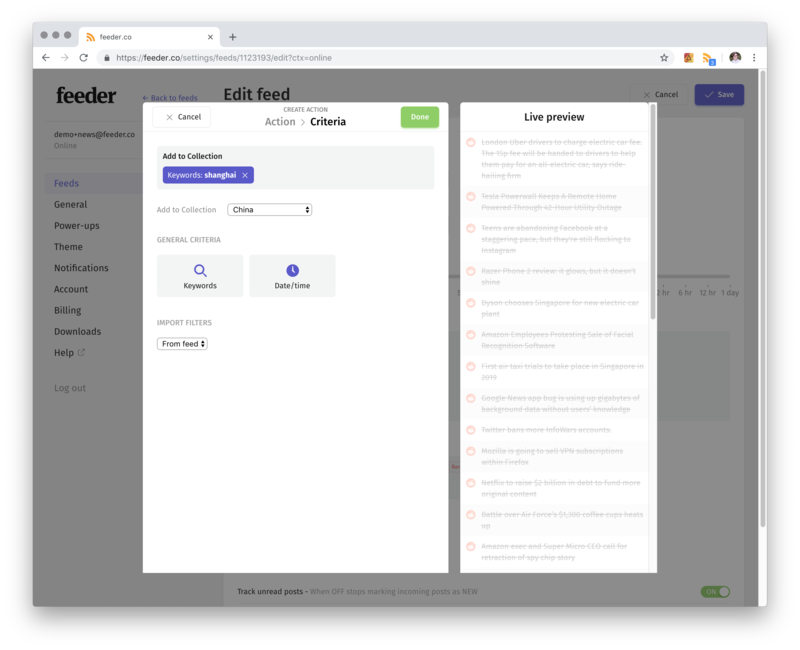 Since a post can be added to multiple collections, we recommend to instead use Collections with Actions whenever possible. When a post is filtered out using an Incoming Filter, it will also be filtered out from any collection it is contained in. So if you add filters to a feed that also has actions, you will end up with missing entries.